On April 13, 2018, if DaVinci paints “The Millennial Mona Lisa,” he will probably sign his name down in the right-hand corner. But he wouldn’t be required to sign a credit card transaction receipt if he bought a big-screen TV that day. That’s because beginning on that date, credit cards will no longer require a signature for any point-of-sale transactions made in the U. S. and Canada. 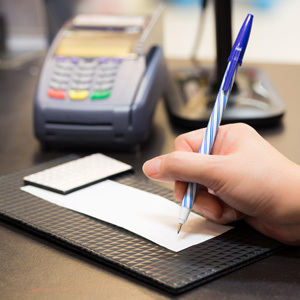 Merchants with credit card readers that require a signature on the screen may not be ready in April if they have not upgraded their point-of-sale software in time. It’s not a difficult upgrade, but you may have to sign for a while longer if merchants are as slow to upgrade their software as they were to change to the EMV chip card reader terminals. If you are one of those merchants that still has not found an EMV chip card reader that is right for you, E-Payment Solutions can help. We offer the equipment that provides business with compliance and protection. What Does “No Signature” Mean for Consumers? Consumers are the real beneficiaries of this change. The bottom line is, it will be faster and easier for consumers to shop. If you are worried that this will open the door to more fraud, don’t be. Signature authentication has not been valuable for many years. Mastercard was the first to make the decision to eliminate signatures. It made its announcement in October last year, the other credit card companies soon fell in line. Discover announced on Dec. 6, that it, too, would abandon the signature requirement. American express announced on December 11, and Visa announced on January 12 of this year. The theory that eliminating signatures would increase sales was unanimous. As a merchant, if you are wondering how this change will affect your Nashville credit card processing services, merchant account, or POS System this would be a good time to make additional changes, please give us a call at 615-902-0300.